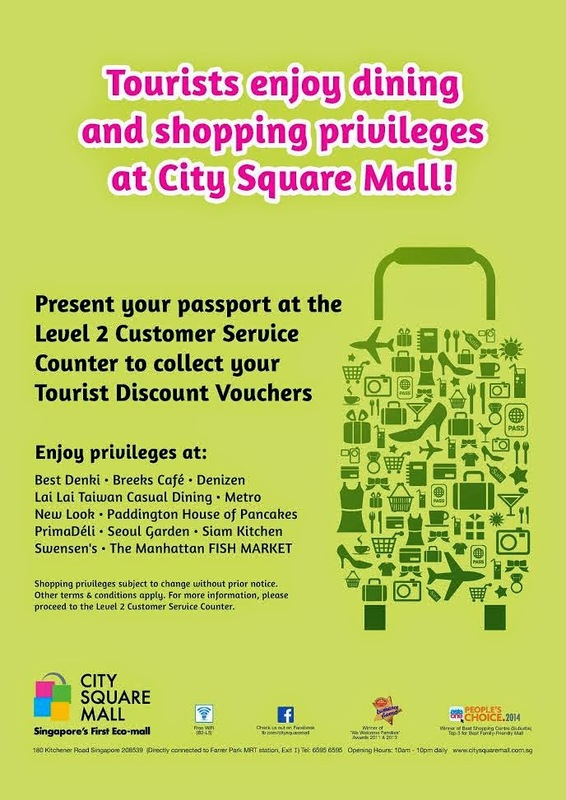 City Square Mall Launches its First Tourist Privilege Programme ! It is a good news for those who travel to Singapore. City Square Mall, owned and managed by City Developments Limited (CDL), launhes a Tourist Privilege Programme. Given its close proximity to Little India and opposite ParkRoyal (hotel) on Kitchener Road, City Square Mall sees tourists frequently and aims to enhance the experience for this group of shoppers through the Tourists Privilege Programme. The Tourist Privilege Programme offers a variety of shopping and dining discounts within the mall. Tourists only need to present their passports at the Level 2 Customer Service Counter at City Square Mall to redeem their Tourist Discount Vouchers. Each tourist can redeem on set of Tourist Discount Vouchers and all stated discounts are valid to 31 December 2014, unless otherwise stated. Terms and conditions apply. Participating Outlets - Breeks Cafe, Denizen, Metro, New Look, Best Denki and etc.